License and registration? While it's no fun being pulled over by the cops for speeding, (luckily this hasn't happened to me for a while) it is fun to play one on TV...or in a museum. 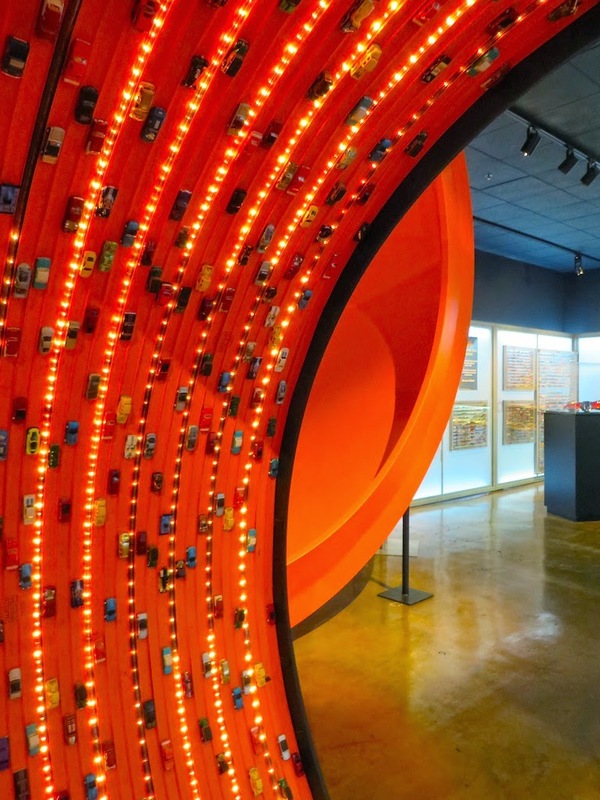 At the Petersen Automotive Museum in L.A. along the famous Miracle Mile, you can live out all of your car fantasies, including being a cop (or in my case the fashion police) or driving through the country in your Ford Model T or speeding down the track as a race car driver. 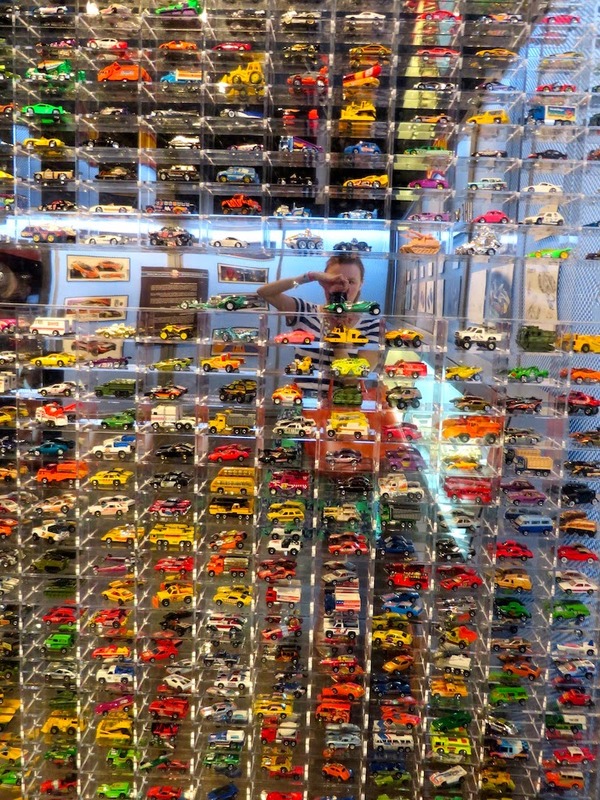 As you can see from the pictures above I had a lot of fun in the children's section of the Petersen Museum, but the museum truly has so much more to offer for car lovers and indifferent wives (such as myself) alike. I don't know much about cars, but my husband is, to put it mildly, a car fanatic. Regardless, we both equally enjoyed the museum. 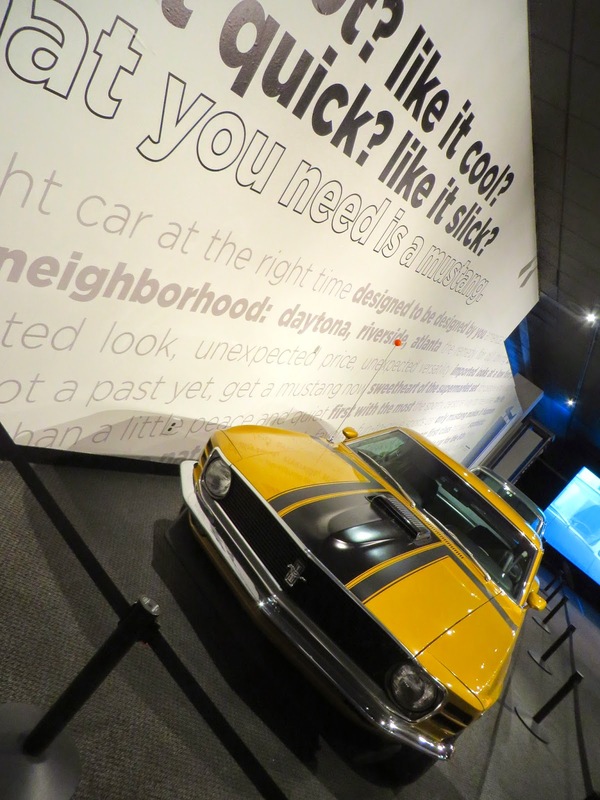 We actually visited the museum last month for a special event celebrating the Ford Mustang's 50th anniversary. My husband has a Mustang and loves the car so we had to check out the festivities and the exhibit to commemorate the anniversary. Below is a picture of the museum's exhibition celebrating the Mustang in all its glory. 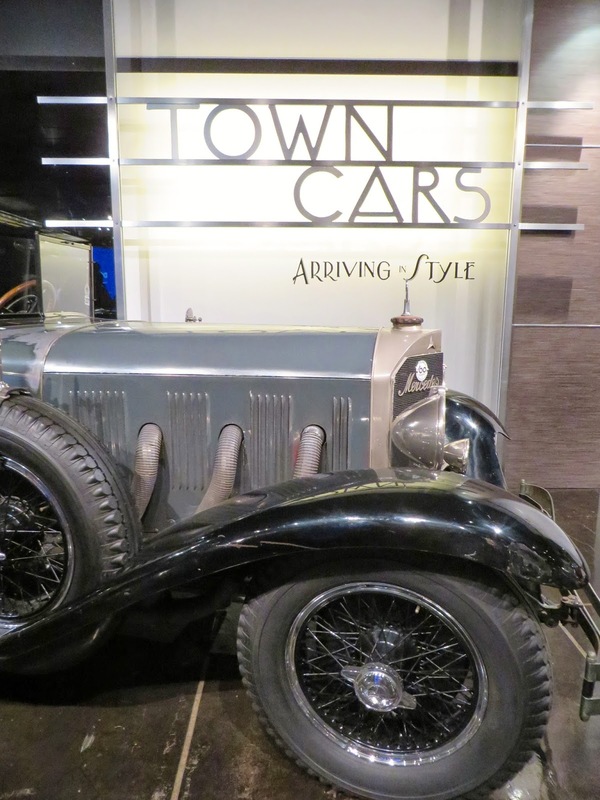 The museum's permanent collection takes you on a tour through the history of the automobile by illustrating how cars evolved over each progressing decade. My favorite decade would most certainly be the 1930s, a decade in which cars were truly icons of style and glamor in my opinion, as evident by this mock set up of a Packard dealership below. I can just imagine myself traveling back in time to purchase one of these beauties. In some of the museum's special exhibits, visitors are given a glimpse into the unique, rare not to mention bizarre world of cars. One exhibit on Town Cars and Chauffeurs featured Liberace's Rolls Royce. (This is where the bizarre comes into play!) It was like a gigantic disco ball threw up on a car. However, I found myself strangely transfixed by its gaudy elegance. I guess it's because I gravitate towards shiny things! Luckily the exhibit on Town Cars offered some more sophisticated and tasteful cars. They also offered some sage advice for drivers found in a manual for chauffeurs written back in 1906 when there was a real art to the profession. 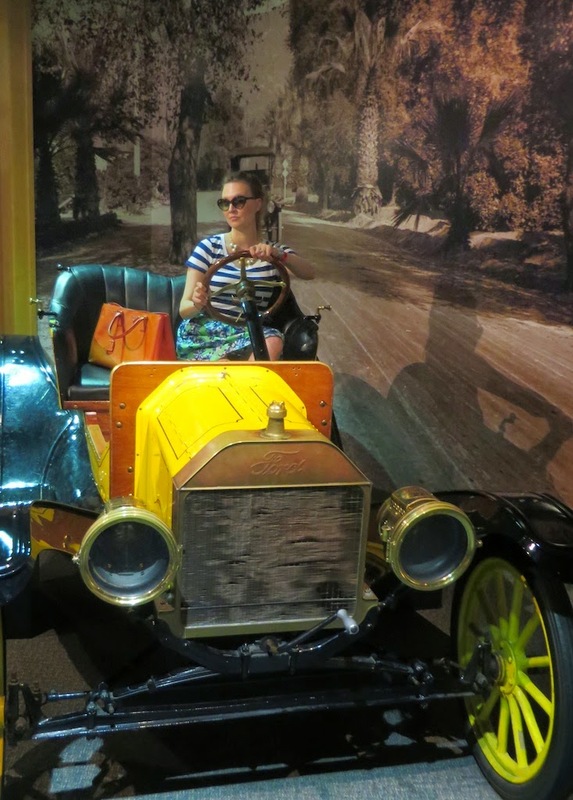 I also found myself also enamored with things that are related to cars, but not quite cars, in the museum. 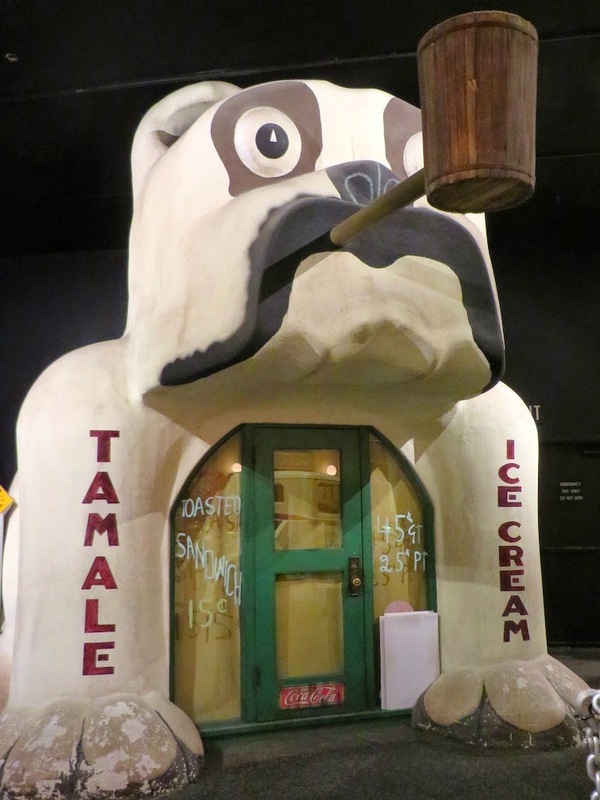 Here are just some of the other random things I enjoyed from the museum including a tamale stand in the shape of a pipe smoking dog, a Roy Lichtenstein-esque back drop to futuristic car, and some random artistic photos of the museum that suited my fancy. I hope you enjoyed this ride through the Petersen Automotive Museum with me. One of the best parts of the museum was a tour given of the museum's vault and its vast collection of cars, which I could not show here because cameras were not allowed due to the fact that they don't want security, entrances and exits to be shown in case someone is planning a heist! I can understand the need for safety and the paranoia because some of the cars that the vault houses are worth tens of millions of dollars. It was fun to be up close to such exquisite cars and also famous ones. For example, Magnum P.I. 's red Ferrari was down there, as well as cars owned by Elvis and other notable celebrities. So check out the museum for yourself! It's worth the trip, especially if you know someone who loves cars, or if you are a novice such as myself and want to learn a little more about the topic. But don't speed or dress unfashionably or else officer Katie might give you a ticket (while ridding side-saddle on a motorcycle)! It certainly was a fun field trip adventure! This outfit is gorgeous and I love the photos - looks like such a fun exhibit!